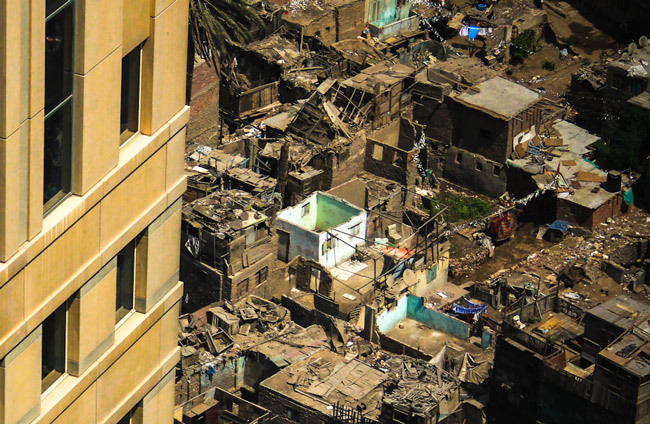 The slums of Cairo’s Ramlet Boulaq, spread out beneath Nile City’s gleaming towers, lack almost all modern conveniences, such as plumbing and electricity. The image is part of a series by Al-Jazeera on the rich-poor divide in Cairo. Bill Clinton to Muslims: “”You cannot live in a shame-based world.” The former president spoke in an interview with CBS: “There’s too much diversity. There’s too much stuff goin’ on the internet You gotta be able to say, if you believe in Islam, that, ‘I believe in a god and a prophet strong enough to withstand the criticisms of petty, narrow-minded, mean-spirited people. I believe that the cultural crassness I abhor will, in the end, fall before the values that I exalt. '” Regarding the ongoing violence in Syria, which neither the U.S. nor U.N. have been able to end, Clinton called the situation “really difficult,” but suggested the U.S. consider “nonlethal options” to support the Syrian opposition. When pressed as to what those options might be, Clinton said “Well, I don’t know … They’re getting guns. Who’s giving ’em to ’em?” From CBS News. Netanyahu’s Iran Blunders: “Shaul Mofaz, the leader of Israel’s centrist Kadima party, posed three questions this month to Benjamin Netanyahu. Speaking in the Knesset, he said: “Prime minister, tell me, who is our biggest enemy, the U.S. or Iran? Who do you want replaced, Ahmadinejad or Obama? How low are you prepared to drag relations with our closest ally?” Ouch. Netanyahu has talked himself into a corner on Iran. He has set so many “red lines” on the Iranian nuclear program nobody can remember them. He has taken to fuming publicly over President Obama’s refusal to do the same. Of late he has juggled metaphors: Iran is now “20 yards” from “touchdown.” His cry-wolf dilemma comes right out of a children’s book. It was in 1992 that he said Iran was three to five years from nuclear capacity. […] The mistake Netanyahu has made is to believe he can go over the head of President Obama. He has tried through Congress, where his speech last year earned 29 standing ovations. He has greeted Romney in Israel as if he were on a state visit. He has said those “who refuse to put red lines before Iran don’t have a moral right to place a red light before Israel.” He has given critical interviews on U.S. TV networks in the midst of a presidential campaign. And he hath protested far too much that he has no intention — none — of swaying the outcome.” Roger Cohen in The Times. Summer ice in the Arctic Ocean is vanishing rapidly: “Though the extent of the September sea ice did bounce back a little from 2007’s nadir, in every year since then the minimum has been lower than it was in every year before 2007. And this year 2007’s record has not been merely broken, it has been smashed. Coverage fell below 4.17m km2 as early as August 26th. By September 16th, which America’s National Snow and Ice Data Centre (NSIDC) thinks marked the low point, it was down to 3.41m km2 (see map). That is the European Union minus Greece, Portugal, Ireland, Britain and Germany. […] The summer sea ice is shrinking so much mostly because greenhouse warming is raising Arctic temperatures. This has direct effects: when the air is warmer, more ice melts. It also has indirect effects. Warm, salty water from the North Atlantic sliding below the cold, fresh upper layers of the Barents Sea may be one of them. Another could be that warmer air is often moister. Moist air traps more heat in summer. In winter it tends to create more clouds, which keeps the surface below warm.” From the Economist. J.K. Rowling goes adult: “Rowling isn’t relying on magic as the release date for her adult novel, The Casual Vacancy, draws near. She believes her reputation for creating great characters and compelling stories will trump any spell that Harry or his mentor, the all-powerful Professor Dumbledore, could ever conjure. In her only U.S. newspaper interview before Thursday’s publication of The Casual Vacancy (Little, Brown, $35), Rowling, in a sit-down interview in the Scottish capital where she lives, shares with USA TODAY why she wrote the novel that takes her career in a new direction, and the excitement she feels in the run-up to its release, five years after the final Potter book was published. […] “I don’t think everyone will like the book,” she says. “But I’m proud of this book. I like this book. It is what it’s meant to be. As an author, you really can’t say more than that. I don’t mean this arrogantly, but if people don’t like it, well, that’s how it should be, isn’t it? That’s art. It’s all subjective. And I can live with that.”” From USA Today. This coming from a man who doesn’t quite understand what to do with a good cigar ! This from a man who was ushered out of office for having Monica Lewinsky on his pair, along with a few other reasons. The question is: Can a good Muslim be a good American? Theologically- NO…..Because his allegiance is to Allah, the moon god of Arabia. Religiously- NO….. Because no other religion is accepted by his Allah except Islam. . Scripturally- NO Because his allegiance is to the five Pillars of Islam and the Quran. Geographically- NO….. Because his allegiance to Islam forbids him to make friends with Christians or Jews. Politically-NO….. Because he must submit to the mullahs (spiritual leaders), who teach annihilation of Israel and destruction of America, the great Satin. Domestically-NO…..Because he is instructed to marry four women and beat and scourage his wife when she disobeys him. Intellectually-NO. …..Because he cannot accept the American Constitution since it is based on Biblical principles and he believes the Bible to be corrupt.. Philosophically-NO….. Because Islam, Muhammad, and the Quran does not allow freedom of religion and expression. Democracy and Islam cannot co-exist. Every Muslim government is either dictatorial of autocratic. Spiritually-NO…..Because when we declare “one nation under God”, The Christians God is loving and kind, while Allah is NEVER referred to as the Heavenly father. Therefore, after much study and deliberation… Perhaps we should be very suspicious of ALL MUSLIMS in this country. They obviously cannot be both “good” Muslims and “good” Americans. Call it what you wish its still the truth— and you had better believe it!! The more who understand this, the better it will be for our country and our future. The religious war is bigger than we know or understand !! The Muslims have said they will destroy us from within. Therefore freedom is not free !!! !